I had my home folder encrypted during installation by checking "Encrypt my home folder". Now, I'd like to reinstall the system, but reuse this home folder. It seems that Ubuntu does not take care of it automatically. Removing encryption and encrypting everything once more sounds incredibly workaroundish. Depending on how you perform it, it could also leave out temporary unencrypted data ready to be recovered with recovery tools. Even when discarded after the migration process. Well, yes. That thread resolved my problem. However, I did some research prior to posting this (which I always do) and the answer was nowhere to be found. That's because I never saw the bloody form with encryption options disabled. I sincerely hope there's more like-minded, precautious folk out there (if not, humanity is doomed). IMO they will find this doubt reworded as "Reusing encrypted home …" helpful. That's my opinion, however, it's up to you what you do with this thread. After all, the reputation score is the ultimate measure of one's right. 1: Yes, I do have a backup. Still, why resorting to backup when you can easily preserve your original data? 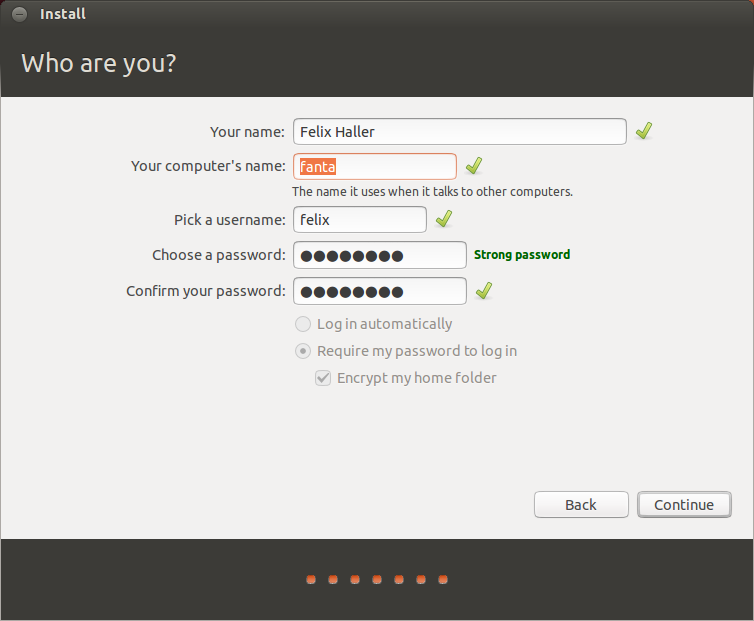 Ubuntu DOES take care of that automatically. I mistakenly assumed that the problems described under the first link were happening despite using the same username and password combination. It seems that some other combination was used, and a fresh install reuses encrypted $HOME quite seamlessly. Kudos to @Panther for showing me the thread about disabled encryption options in a comment below. IMHO if your data is important enough to encrypt it is important enough to backup and you need a backup strategy for encrypted data. Note: /home/.ecryptfs/*/.ecryptfs is your configuration , take care when restoring the archive, you may wish to skip that file or back it up separate. With a working backup you can try upgrading or installing preserving $HOME and if it fails for any reason, fresh install and restore from backup. When you reinstall, use the same UID and password as with your current install. IMHO the biggest "problem" with encryption is people forget they need an encrypted backup in the event of failure, it is not if you will have a system failure, but when it happens, are you prepared with a working backup. Not the answer you're looking for? Browse other questions tagged system-installation encryption home-directory ecryptfs or ask your own question. Why can I not deselect “encrypt my home folder”? Are all of the backup files & folders of encrypted /home folder also encrypted on the backup HDD? How secure is an encrypted partition?